Recent events like the Elephant Room 2 further ushering Word Faith prosperity preacher T.D. Jakes into the mainstream of professing Christendom also opens wider the door for others, e.g. Creflo Dollar. I’ve told you before that Dollar’s been appearing on the Life TV Today program of James Robison for years now.1 This is the same program that wildly popular Southern Baptist Beth Moore is on every Wednesday. Apprising Ministries continues to warn that anyone willing to look at the evidence will clearly see that heretical Word Faith teachers like pastrix Christine Caine are advancing into the heart of the Christian community. Creflo Dollar is without question 1) a WF prosperity/positive confession preacher and 2) an absolute superstar among their spiritually sordid ranks. I find it sad that such as these are now slithering into evangelicalism. Reverend Creflo Dollar, the well known pastor of an Atlanta-area mega church, has been arrested on a family violence charge. Fayette County deputies arrested the 50-year-old pastor at his home on Sandy Creek Road Thursday night. If interested, the reader can peruse the actual Fayette County Sheriff’s Office deputy’s report itself by clicking here. 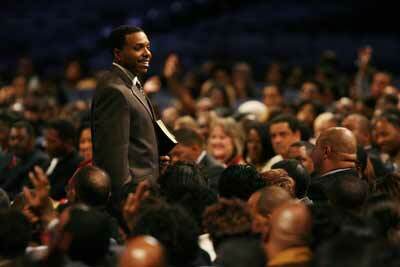 The story then took another odd twist in Word Faith Preacher Creflo Dollar: “I Shouldn’t Have Been Arrested”. Remember now, the law enforcement document contains the testimony of Dollar’s two involved daughters. This means the supposed “exaggeration and sensationalism” would have originated with them; and not the deputies. As I watched this, my first thought was, “Methinks thou dost protest too much.” I also realize we live in a nation awash with the false philosophy—in the end it’s all it is—of postmodernity which can’t find its face with its hand. We’re supposed to jettison our God-given reasoning abilities and then bend over backward to give everyone the benefit of the doubt. Just coincidentally (?) doubt and obfuscation are the classic hallmarks of postmodernism. Church leaders are supposed to speak up for those who can’t speak for themselves; i.e. to give them voice, yet too often the cult of celebrity rules in the Christian community today in contradistinction e.g. to James 2:1-9. With this in mind then, did you notice that his congregation treated Creflo Dollar as if he had performed an act of heroism? Dollar tells them: “All is well in the Dollar household.” However, we have to wonder; is it really? By saying the Sheriff’s report contains false information, Creflo Dollar has essentially accused his daughters of lying; unless he believes the deputies made the information up. Could Dollar’s daughter’s have lied? Of course. I was head football coach at a high school for years. Trust me, I’m well aware of how teenagers can be; being that I coached in what I called a parentally challenged area, I also know how parents can act when frustrated as well. Certainly people are presumed innocent until proven guilty; however, let’s also keep in mind here that those Fayette Sheriff’s deputies obviously felt they had probable cause to arrest Creflo Dollar after their investigation. Dollar’s defense thus far is using Scripture to make it seem as if he’s been attacked by Satan as well as essentially resorting to ad hominem and attacking the credibility of his own daughters and the law enforcement officers. It looks to me like Creflo Dollar seems to want to sweep this under the carpet. At this point, we don’t know what actually happened; but apparently it’s not the first time something like this has happened in the Dollar household. Let us be praying that the Lord will bring the truth to light so those in sin may find forgiveness and restoration.